Jute is a lustrous and slender fiber that can be easily molded into rough, durable and sturdy threads. 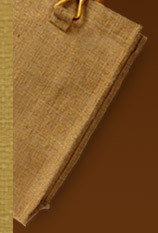 Jute is one of the cost-effective natural fibers. Popularly known as hessian, it has become highly popular for its eco friendly nature. This strongest and long lasting fiber finds wide application in varied industries. It is used for designing Flower Pot, Bowls, Box, Coaster, Flower, Hammocks, Jewelry and so on. Jute Zipped Pouch, one of the innovative and attractive products, is frenzy the world over. They can be availed in different prints, designs and patters as per the prerequisites of the user. Within a short span of time, they have emerged for business gifting and endorsement purposes. Made for keeping different types of goods in different sizes, jute zipped pouch provide them with complete safety and security. High tensile power, resilience and heat resistance property ensure long lasting life of Jute Zipped Pouch with no maintenance. Infinite styles, patterns, dimensions, forms, and colors are there to match the needs of everyone, be it a kid, young or adult. A number of eye catching designs like flower-patterns, asymmetrical designs and so on that users have never seen before enhances their value. Extremely strong, eco-friendly, and hard-wearing are the features of such jute zipped pouch that have grabbed attention of every other person. Jute zippered pouch have become the most modern rage amongst fashion-cautious people, who also look for quality and durability. These most well-liked pouches have been catering to the requisites of people as they are easy to carry in pockets as well. 100% reusable, cost effectiveness and eco-friendly nature are like icing on the cake. Their high end features make them the perfect option to give as gifts or as outstanding promotional mementos. Adorned with attractive zips, jute zippered pouch bags are perfect means of keeping things safe ad carry them anywhere without any burden.